Throughout all 9 Star Wars movies there is a “light” and a “dark” side. The young Anakin Skywalker was a “good boy” with the talent and potential to be a great Jedi. He had some great mentors/coaches and was well set-up for success. 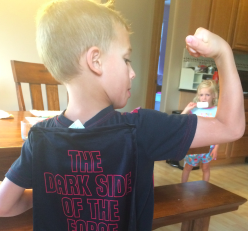 At the same time, the “dark side” was constantly recruiting this young “5 Star” Recruit. The “dark side” was so powerful and relentless that Anakin let all the negativity break him. Anakin wanted the easier route. He didn’t see immediate results, thought he could have it all somewhere else. He left to join The Emperor and (spoiler alert) became Darth Vader. Anakin was talented, but he was a bad teammate. Players are going to leave. It is so common that it’s woven into the fabric of athletics nowadays. The influence of various “dark sides” exist everywhere. It could be a friend, girlfriend, or even a parent. It could be negativity from the past, or could come from pressure to succeed. Over my years I have seen it all. It is a constant fight for coaches. And it goes for my current team too. How do you fight the “dark side?” The answer is simple. First, there are some things you can’t control and you have to understand that – kids have a thing called free will and that includes the possibility that they’ll make dumb choices. That being said, you can fight a great deal simply by fostering a deep care , a love for your team. Next, you must show your team you care about them. You have to get to know your team and spend time with them. Let them get to know you. Do not be fake. You must be genuine. One of my favorite things to do these days is to take my kids/team to get donuts and just chill. We will talk about everything from Pokemon to Shopkins. Sometimes, because of their schedules, I may only be with one of them. That one-on-one time is special for me as a father, but it also has proven to be very productive as a coach. “Donut time” often has immediate effects. They seem to listen and may even SHARE TOYS WITH ONE ANOTHER! Obviously, they are happy for the treat. But the time spent with them outside of homework, chores, etc. shows them I love them. It is easy to love my current team. The difficult thing is making sure I take the time to show them. A quick story that supports this concept is a conversation I had with CBS Radio host Doug Gottlieb. He and I were talking hoops prior to the NCAA Tournament a few years ago and we began sharing stories about our fathers. He had recently lost his father and mine is battling lung cancer. Doug told me that it is important to not just tell my dad that I love him more often, but make sure I tell him ‘why’ I love him. I often think about Doug’s advice during “Donut Time”. When you spend quality time with your team it strengthens them against the negative outside influences they encounter. As a college coach, I demanded a lot from my team. I would spend “Donut Time” with them sometimes by going to lunch or having them to my house. One of my players once looked me in the eye during a “conditioning” punishment and said, “Coach, if I didn’t know you’ve got my back I’d bounce out the gym right now!” I was asking a lot of him mentally and physically and at the point where he was tempted to quit, he relied on our relationship. When Luke Skywalker was young, he also kept questioning the teachings of Yoda and Obi-Wan. He wanted to see results as well. Luke’s mentors kept telling him, “Be patient. Don’t take the easy route. Don’t listen to outside influences that have their own agendas.” Eventually they won him over by demonstrating their deep care for him and were able to show Luke the big picture. Of course, Luke’s attitude, hard work, and patience eventually made him not only a mature superstar but he even had the leadership and credibility to change Darth Vader back to good!